All Diabetics should be seeing a Chiropodist/Podiatrist/Foot Specialist in regular intervals. Diabetics have an increased risk of problems leading to foot and/or lower limb issues which can range in severity including amputation. Common condition's associated with diabetes are neuropathy (loss of sensation), peripheral arterial disorders (loss of blood flow) and a decreased immune response. All of these make diabetic patients especially exposed to risk and increases the need for them to be getting their feet checked on a regular basis. Your Chiropodist/Podiatrist/Foot Specialist will monitor your condition through thorough vascular (blood), neurological (nerve), dermatological (skin and nails), biomechanical and gait exams. Problems from diabetes are the leading cause of non-injury related amputations. Wounds or serious infection can manifest quickly. Often, a patients first complaint of peripheral neuropathy will be altered sensation. This can feel like tingling, burning, numbness or pin-and-needles. As the neuropathy progresses the patient eventually loses all sensation. Protective sensation may become completely lost. Therefore, the patient may not feel if they are suffering from an open sore, cut, or blister. Often patients are unable to feel the temperature of the bath water and burn themselves. Foot shape may change in a diabetic due to the loss of sensation and vascular compromise. This may manifest as a “Charcot Foot” or an “Intrinsic Minus Foot” – both leading to decreased Quality of Life and increased risk of complications. Diabetics are more prone to blood circulation problems. These can be of Arterial (blood flow away from the heart) or venous (blood flow back to the heart) origin. Most commonly the blood flow to the foot is compromised due to the high levels of glucose circulating in the blood (may present as bounding or absent pulses in the foot). Blood flow back to heart becomes compromised and most often presents as swelling in the legs. 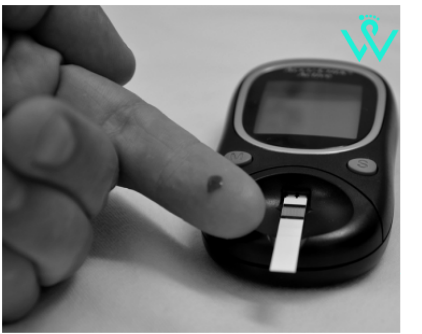 Diabetics have a decreased chance in healing from infection due to the the high levels of glucose and the compromised blood supply. The glucose causes the immune system to become "sluggish" and a diabetic ulcer may take months to years to heal.